Read our new blog by Sarah Johnsen, which explores the evidence for this group of welfare service users. Sarah introduces a briefing paper with more detail on the history and arguments on this topic. Welfare Conditionality: Sanctions, Support and Behaviour Change project leader Professor Peter Dwyer gave evidence to the Work and Pensions Select Committee today. He was one of 10 witnesses asked to appear before the MPs to assist their inquiry into benefit sanctions and support. The inquiry follows last year’s Oakley Review with a remit to inquire beyond the scope of that report. Read our written evidence submission here. View the evidence session here. Read our new blog which comments on the latest DWP statistics for sanctions on benefit claimants. Is there a connection to the growing use of food banks? Read our latest blog and briefing paper on the ongoing attempt to ‘rewrite the welfare contract’ for disabled people and the arguments on this controversial topic within UK welfare policy. The Sustainable Housing & Urban Studies Unit (SHUSU) at the University of Salford has an exciting opportunity for a researcher to support our research activities for a fixed term period and help shape and deliver its growing portfolio of work. A significant component of the role will be to engage, as the University of Salford partner, with the Economic and Social Research Council (ESRC) funded project Welfare Conditionality: Sanctions Support and Behaviour Change. We are pleased to announce an opportunity for a funded PhD at the University of Salford. Successive Governments have sought to extend the use of welfare conditionality, as a defining feature of many recent welfare reforms. At the same time, successive Governments have also increasingly curtailed migrants’ rights to welfare in the UK. Literature that explores welfare to work policy in relation to migrants and ethnicity suggests that discriminatory attitudes may be significant in influencing both higher levels of sanction and lower quality of support for migrant communities. This Monday, the third expert seminar as part of the ESRC ‘Welfare Conditionality: Sanctions, Support and Behaviour Change’ research project took place in Sheffield. A range of experts, speaking from diverse perspectives (economics, human geography, sociology and psychology) were invited to give their take on the role of welfare conditionality in changing the behaviour of welfare recipients. 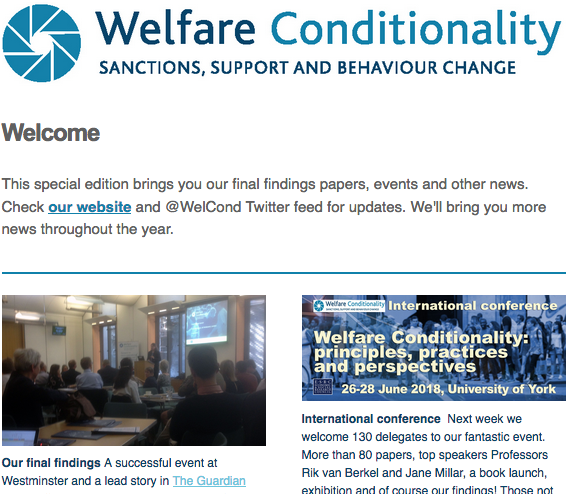 Last week, the first event of our research project ‘Welfare Conditionality: Sanctions, Support and Behaviour Change’ took place at the University of York. This five year (2013-2018) programme aims to create an international and interdisciplinary focal point for social science research on welfare conditionality, that is, the linking welfare benefits and services to ‘responsible’ behaviour. 2. Ethicality: to consider the particular circumstances in which the use of conditionality may, or may not, be ethically justified.